My Teardrop, back at Vedauwoo, all tricked out! Check out my pimped out, powered up Teardrop! 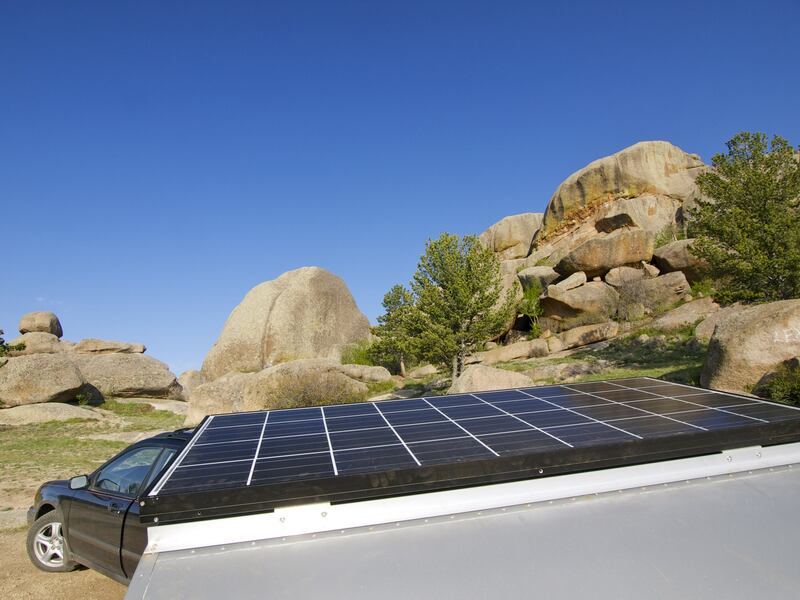 Yesterday, with the help of solar mastermind Lawrence Jenkins at Front Range Renewable Energy in Frederick, Colorado I had a solar panel installed on my Teardrop. I’m one step closer to having a fully mobile office! The panel is a 135-watt, 28-pound Kyocera panel, mounted to the roof with two aluminum brackets. The wires run down through the sunroof to a 10-amp charge controller and then to a 55 amp-hour sealed battery. 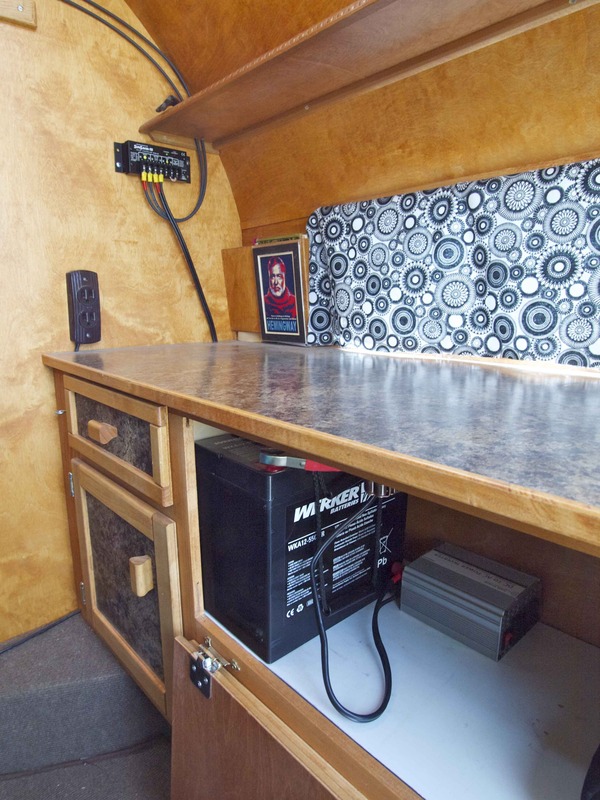 A 400-watt inverter then converts the DC power to AC, giving me more than enough power to run my laptop, charge my phone and camera and run the Teardrop’s interior LED lights. Charge controller mounted to the wall, running to a 55 amp hour battery and an inverter. Pretty slick! I make my living on the road as a freelance writer, mainly by covering geoscience news for EARTH magazine. Each month I write between five and ten stories for EARTH, which takes no small amount of time at the keyboard. That panel looks like it was made for this Teardrop! It fits perfectly sideways on the roof. Too cool. Now to solve my internet problem. I have a mobile hot spot through my Verizon Android phone, but it’s very temperamental and not good for my blood pressure. Now that I have a power source, I might look into a cell signal booster. Ideas and suggestions are more than welcome! 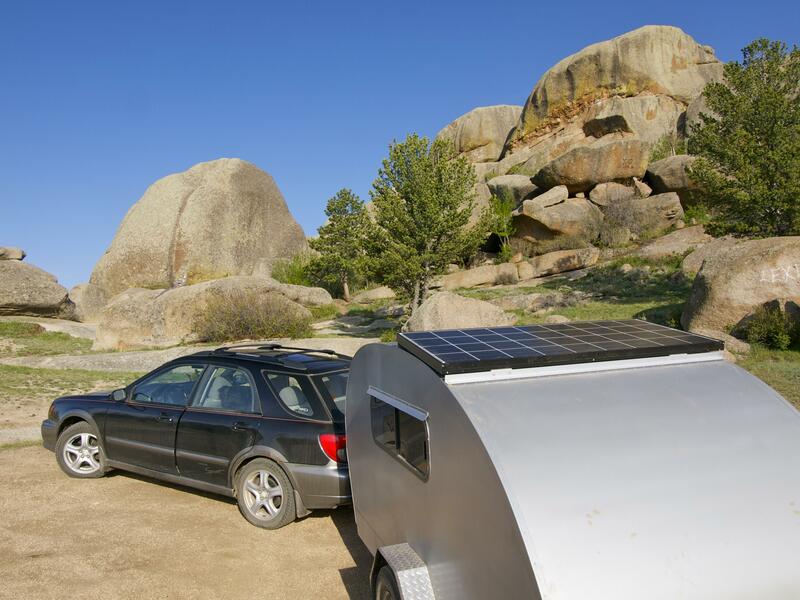 This entry was posted in Sustainable Living, Uncategorized, Vagabonding 101 and tagged Teardrop trailer. Bookmark the permalink. 55 Responses to The Power of the Sun, In My Teardrop! Wow – how I envy your lifestyle and your job! I absolutely love reading about your adventures and travels! Roll on! So much of the “back to the land” and “self-sufficiency” movement is perceived as a relinquishing of all the latest technologies. I love that instead, you’re finding ways to integrate into your lifestyle! Kudos. High tech and outdoorsy – lovin’ it! This is super cool! You’ll be pretty much set after working out the internet connection issue. Maybe you can recoup some of the costs on your taxes??? That would make it even cooler. You are an inspiration ……LOVE IT!!! I always look forward to seeing your new posts cause I know I am going to learn something and see something new!! Doesn’t the battery need to be in a vented space? Sweet set up! I was first introduced to “Front Range” by some off-grid friends in Michigan’s Upper Peninsula. I will be interested to see what you come up with to solve your internet connectivity issues. I’m super impressed with your solar setup, inverter and battery setup! Amazing how the solar panel fits exactly on the hatch! We had hoped we could charge our cell phones on the inverter/connection to car battery Egon put in the teardrop, but just realized that’s not how he set up the camper. We tried a small solar panel on a portable jumperbox/battery, but charging all day only recharges it a little over an hour of power. You did it up right! And you are right – you have the best views for your office! Now you really have everything! What a great idea. I gave you a Bean’s Pat today in hopes other RV-ers would see what you have done and follow suit. Thanks for sharing. Simply my way of telling my readers what I think is the best blog i’ve read for the day. I started it in response to the awards readers were giving me. It’s a payback in the form of a play on my name. I love following you. You’re doing the kinds of things I would have done in my younger days. Now I’m a blonde old broad who’s following her dreams and having the time of my life. I’ve now been a full time RV-er for eight years, and by the end of this year I will have visited all 50 states — Hawaii having been done before I bought my RV. Keep traveling and telling us all about it. . When I set up our off grid cabin I used an 80- watt panel and a 110 ah gel battery. I built in a little expansion potential with a 30 amp charge controller. Initially I set it up with a 1000 watt inverter for the 120 volt stuff. All of our cabins lighting is LED running in a 12 volt environment, part of that 12 volt system include a standard 12 cigarette socket…which can be used for any car type adapter. This eliminates the need to run the inverter for many items (cell charger, ipod music system, portable DVD player etc) Since this initial install I upgraded the inverter to 2500 watts. This will allow me to use some slightly bigger power tools as the cabin is still in a final stages of construction. I can now power my miter saw via solar…great for doing some trim work. I built a small “portable” solar generator that we use on road trips to charge the Nikons battery, laptop etc. It all fits in a little “high tech” aluminum briefcase. For extended cloudy times, are you able to plug-in to the grid and charge your battery back up? That would allow you to go back on the road to remote areas and still have power. Or do you have to have a physical connection to the grid if it’s cloudy and your battery has been depleted? I suspect for many folks with a trailer as a “second” home, the solar panel on the trailer is not nearly as efficient as putting it on the primary home where the power it generates is usable more often. However, having a battery and inverter in the trailer that could be charged before (and during) a road trip could be a less expensive way to get similar functionality. I can’t tell in the photo if you had to sacrifice your very awesome pop-up skylight for the solar panel installation. But I sure hope not! Nice set up! I have wanted to build a teardrop for a while, love those little trailers. I have also been considering Solar for our trailer. That is some hott lifestyle engineering. I like the detailed pricing info. Hello there, You’ve done an excellent job here. I will definitely be back. And will personally recommend it to my friends. I’m confident they will benefit from this site. work on. You have done a outstanding job! Appreciate it! Wow! What an idea ! What a concept ! Lovely . Amazing. A few months ago I had this idea to sell everything I own, quit my job, and travel in a teardrop trailer around the country. I’m a photographer, but my background is in creative writing. I got SO excited when I saw your site while looking for solar panel options for the hypothetical teardrop trailer I will buy next year to accomplish my dream. Your posts are great and I look forward to following your blog! Mary, I’ve enjoyed reading so many of your posts. Your blog is an inspiration in simplicity and goodness. Thank you for sharing your life with us. I wish you safe travels. How wide is your teardrop? 5 feet wide by 10 feet long, plus the wheels and hitch. It’s about 700 pounds, empty.